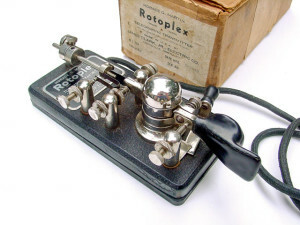 Like many successful products, the Vibroplex inspired others to manufacture unauthorized copies. Until 1913, Martin couldn’t do much about the clones, because another inventor, William O. Coffe of Cleveland, Ohio, had filed a patent for a mechanical sending machine on January 11th, 1904, four months before Martin filed for his patent. In 1905 Coffe and a partner formed the Mecograph Company and began making bugs. Coffe sued Martin for patent infringement, and in 1908 actually won the case. However, the court declined to force Martin to pay damages or to stop manufacuring the Vibroplex. 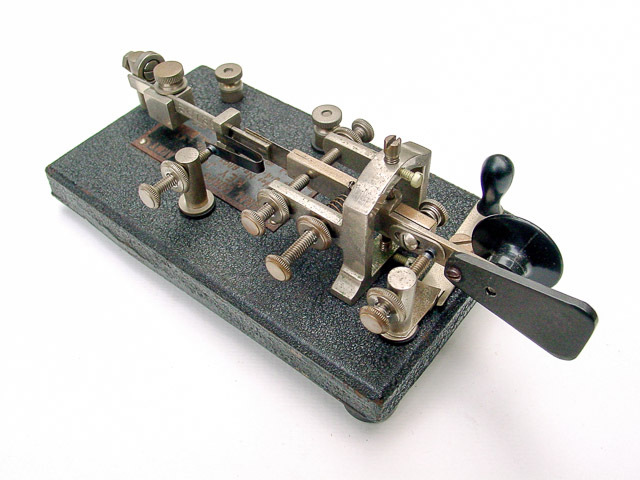 In 1913, Martin and his partner J. E. Albright bought Mecograph and its patent and became the sole owner of all existing patents covering mechanical semiautomatic telegraph keys. By that time several manufacturers were actively making and selling Vibroplex clones. 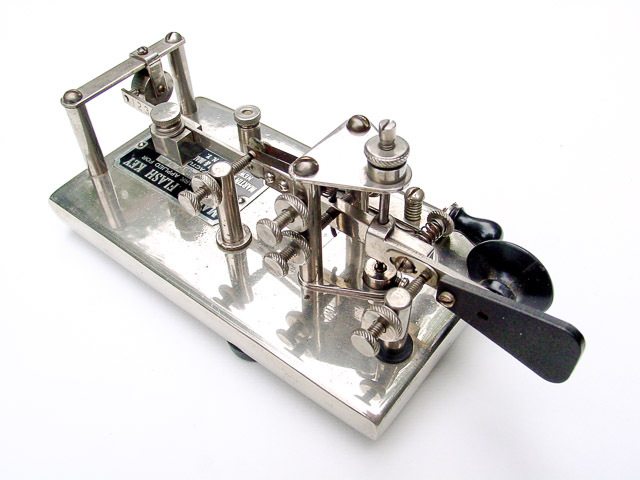 One company, the ATOZ Novelty Company of Chicago, even had the nerve to call its bug the “Improved Vibroplex”. When Martin and Albright bought the Mecograph patent they immediately filed suit against ATOZ and the others and were granted a permanent injunction forcing the clone makers to stop making copies. Albright didn’t just stop there. He sent letters to Western Union and other employers and took out ads threatening to sue anyone and everyone who was using a clone bug unless they purchased a license from him. This tactic was extremely effective, and he sold several thousand licenses. Owners of the clone bugs were required to send their bugs and a $2.00 license fee to Albright, who generally took off any ATOZ or other nameplate and attached a metal tag that said “This machine is NOT guaranteed NOR made but only licensed by J. E. Albright, 253 Broadway, New York”. Bugs with this tag are called “Albright license” bugs. There are a few examples with both the original manufacturer’s nameplate and the Albright tag. In addition to the ATOZ clones and others which were made commercially, “home-brew” bugs resembling the Vibroplex are fairly common. These generally are patterned after the “Original” model, have no nameplate, and look homemade. Some, however, are clearly the work of a skilled craftsman. Most home-brew bugs were probably made between 1910 and WW2. Very few home-brew bugs were built after the war because of the availability of war-surplus bugs and the healthy economy after the war. These copies are of little interest to most collectors because it’s generally impossible to find out anything about the people who made them. Several manufacturers made legal copies of one or more Vibroplex models, and one company made a radically different bug designed by Martin himself. This section is devoted to those bugs. In 1938, two of Horace G. Martin’s sons, J. W. Martin and R. W. Martin, joined with three investors to form the Martin Research and Manufacturing Company, located at 233 Broadway, New York, New York. Little is known about MR&M. Bill Holly’s book describes an agreement between Vibroplex and MR&M whereby MR&M would develop and manufacture bugs and Vibroplex would sell them. However, this agreement was apparently never completed, or was short-lived, because advertisements by MR&M tout the hiring of one E. M. Weber, formerly Sales Manager of Vibroplex, as Secretary and Treasurer of MR&M. J. W. Martin and R. W. Martin were the President and Vice President, respectively, of MR&M. 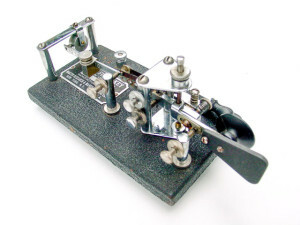 Martin Research and Manufacturing made four models, three of which were patterned after the Vibroplex #1 (Original), #4 (Blue Racer) and #6 (Lightning Bug). These keys were called the #1, #4 and #6 Martin Flash Key. 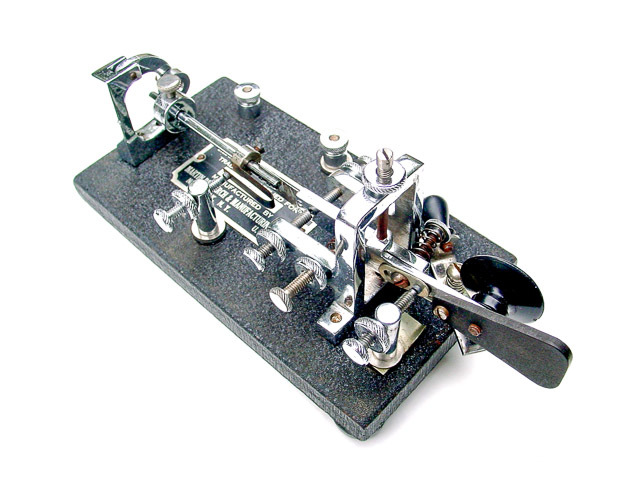 The fourth model was an inexpensive model unlike any Vibroplex model, although it had a mechanism similar to the Midget..
MR&M didn’t last long. In December, 1939, MR&M sold out to the J. H. Bunnell Company, the leading U.S. key manufacturer. Not many Martin Flash Keys were made. Serial numbers seem to range from around 5000 to over 6000, so between one and two thousand of them were made. Just after the Civil War, Jesse H. Bunnell, who had been a telegrapher during the war, went into the telegraph equipment business. At first he joined with others such as Partrick (of Partrick and Carter). In 1881 he patented the “Triumph” key, based on a one-piece steel lever. The Triumph key was very successful, and straight keys based on the design are still being made. The famous J-38 is essentially a Triumph key on a bakelite base. In the 1880s JHB began making the “Double Speed” key, or sideswiper. In the 1920s JHB brought out the Gold Bug, which was, quite frankly, a lousy bug. It was discontinued a few years later. In 1939 JHB got back in the bug business by buying MR&M. They made the same four models, and called them the “Bunnell-Martin Flash Key”. The #1 Original style bug was designated the Model 5-48, the #4 Blue Racer style bug was called the Model 5-47, the #6 Lightning Bug style was the Model 5-45, and the simplified “Amateur” model was the Model 5-46. How many Bunnell-Martin Flash Keys were made is unknown, because the bugs have no serial numbers. They may have been made into the Fifties, but that has not been confirmed. Bunnell also made J-36 bugs for the Signal Corps. 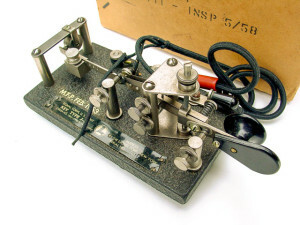 They made two versions, one which was identical to the Vibroplex and Lionel J-36, and another with a small frame which resembles a Blue Racer on a wide base. The bug pictured here is the latter. During World War Two, the Lionel Electric Train Company made thousands of virtually exact copies of the #6 Lightning Bug for the U.S. Army Signal Corps. Because of materials shortages, Lionel had suspended production of electric trains and was making small electromechanical devices for the war effort. Although it was previously thought that Lionel may have licensed the design, it now appears that Lionel simply copied a Vibroplex, and was able to do so because all of Vibroplex’s patents had expired. Lionel’s bugs were designated the J-36, which was the designation the Signal Corps gave any bug. “J-36” was simply the Signal Corps number for a bug, and Lionel was neither the first nor the only manufacturer of the J-36. Vibroplex made J-36s, which were simply #6 Lightning Bugs with a Signal Corps nameplate.JHB made several types of J-36, including a #6 Lightning Bug clone and a version of their #1 Original style bug. Brooklyn Metal Stamping had made the J-36 in the Thirties. The BMS bugs have several novel features. The Lionel J-36 can be identified by its nameplate, its distinctive rounded dot paddle, and slightly different knurling on the screws. Otherwise it’s a #6 Lightning Bug, and parts are interchangeable between the two. The nameplate is the most prominent feature of the Lionel J-36. Long and narrow, it was placed along the left edge near the paddle and fastened to the base by five pins. The Lionel nameplate was made out of a celluloid-type plastic, and the vast majority of Lionel J-36 bugs lack a nameplate. For one thing, many servicemen took their bugs with them when they were discharged, and removed the nameplates at the same time. The Lionel nameplates that were left have generally shrunk badly and many have come loose and fallen off. If you own a Lionel with a nameplate, DO NOT leave it in the sun, get it hot, or get it wet. The last key Horace G. Martin designed was one of the most unusual. The Rotoplex was introduced just before World War 2, and featured a frameless design with a ball-bearing pivot, thumbpiece and fingerpiece molded in a single unit, a built-in cord and wedge rather than binding posts, and a flat-bottomed base with a rubber sheet glued to it. In 1941, Martin was issued US Patent #2,228,469 for this design. The Rotoplex was manufactured by the James Clark Jr. Electric Co. in Louisville, Kentucky, and was made in a J-36 version during the war. The Rotoplex J-36 is identical to the standard J-36 except for an additional Signal Corps nameplate. The key shown is the standard (commercial) version. The J-36 was made by the Brooklyn Metal Stamping company is by far the least common — only a few are known to exist. Like the Rotoplex, the BMS J-36 included several novel features. The damper is not a wheel, but a captive ball bearing inside a slanted tube, the dot spring is mounted on the dot post, not on the lever, and the circuit closer pivot is directly under the vertical pivot rod. BMS made this key in both commercial and military versions.